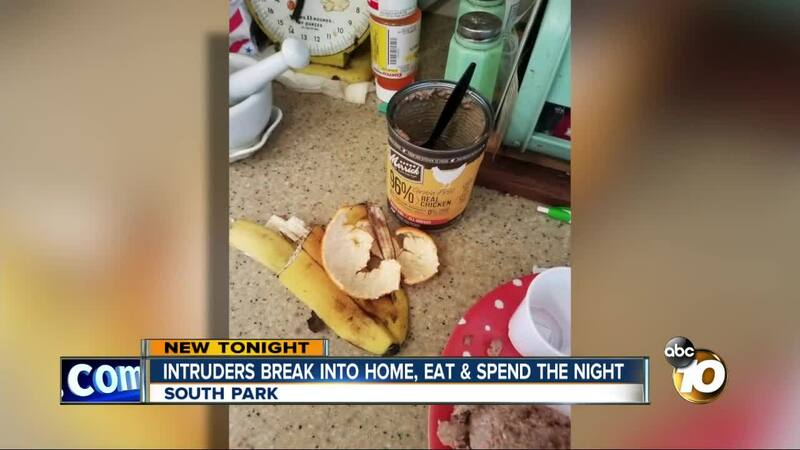 SAN DIEGO (KGTV) - The San Diego Police Department is investigating a strange break-in in South Park. Monday morning, Nikki King and her husband discovered that someone or some people spent the night in their house on Granada Avenue while they were sleeping upstairs. Nikki took several pictures of the mess the trespassers left behind. “There was a tangerine rind and a banana peel and a can of dog food with the fork in it that they used to scoop it out,” King said. “I foster dogs so they have very nice plush blankets and all the blankets had been taken off the couch and made into beds, and some of the doggy toys had been used as pillows,” she added. She says there were several items of value downstairs, but the intruders didn't seem interested. The Kings say they will be locking their doors from now on, and they’re reminding their neighbors to do the same. They are also looking into getting a security system.